do pięknego ciała i młodej skóry! Welcome to our website! Adamowicz Institute is a professional office of aesthetic medicine created with true passion! Many years of experience in the field of face and body cosmetics and modern technological solutions in the field of aesthetic medicine, allow us to offer you top-levelservices. The needs of patients are the most important for us, we approach each of them individually. Our practise is based on Ania Adamowicz’s T.S.T. original method, selecting therapies and treatments to meet the needs, expectations and type of personality. 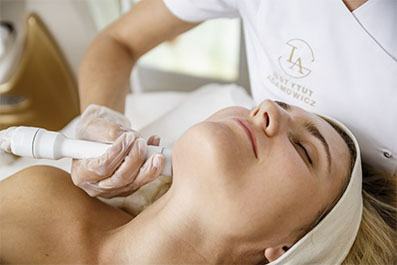 All therapies in IA are accompanied by a three-stage formula: ASSESSMENT, DIAGNOSIS, SOLUTION, which is the basis for 98% effectiveness of skin aesthetic problems.We invite you to visit our office in Warsaw’s Wola. Laser Attack Duo – NEW!!! Anna Adamowicz’s programme – T.S.T. 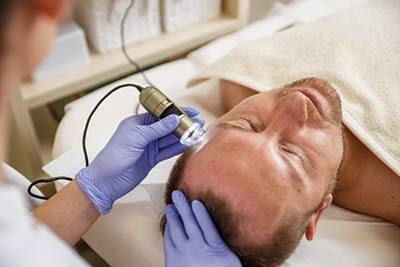 Vacu Oxygen – stop hair loss! After pregnancy, I had some abdomen fat, which, despite exercising, I couldn’t get rid off. After cryolipolysis treatments with vacuum massages, the effect is phenomenal: the abdomen is flat, the skin is firm, I have never seen such an effect of the treatments before! I also received support regarding diet and exercise, so that the effect lasted longer – full professionalism! I’ll come back to sustain the effect. I had acne rosacea in inflammation. Ania started with the tests that showed I have an autoimmune disease. She proposed a gentle calming of the skin with a series of treatments based on azelaic acid, and then treatments to normalise exfoliation of the epidermis and a Neodymium-YAG laser treatment series. I also received dietary recommendations and care tips. After the first treatments I can see an improvement. I’m starting to believe that I’ll finally be able to deal with the problem! I noticed the first symptoms of baldness. Cosmetologist recommended to start with hormones and trace elements tests, she looked at the scalp in a tricho-cam. On this basis, she explained to me why my hair falls out – it turned out to be an androgenic type of baldness. After 3 IA proprietary therapy treatments, the ailment was significantly reduced, and after 6 treatments, the hair started to thicken, I also saw tiny hair growing from the skin. I believe that it will be a success! My main problem was flaccid eyelid, I’m 39 years old and when I did makeup, the skin wrinkled ugly in the fold. After consultation, the cosmetologist recommended plasma treatments; after just one treatment on both eyelids their elasticity improved, the eye opened, and when it comes to the lower eyelid, even deeper mimic wrinkles diminished and the skin was smoothed. For prophylactic purposes I’ll repeat this procedure once a year – it’s worth it! I also consider the mesowave procedure, because I know from a friend who has already done it in IA, that it effectively firms and can be done in the summer. I have been struggling with orange-peel skin for years, I was diagnosed with a painful type of cellulite. As a result of tests commissioned by Ania, it turned out that I have cardiovascular and lymphatic disorders, weakened blood vessels and problems with water retention. Ania recommended me an isometric vacuum massage combined with local ultrasound breaking, I got recommendations for diet and physical activity, and finally I was advised a sport that actually helps!